Spring has finally arrived and the weather is starting to get people excited about summer, BBQs, festivals and much more. Gone are the snowy showers of winter and the painfully cold nights, instead we are left with a wardrobe full of jumpers and nowhere to wear them. You might be realising that it is now time for you to update your wardrobe, wave goodbye to those scarves and hats and get yourself ready for spring. Without a doubt floral has made a comeback to not only the catwalk but to everyday fashion as well. Reflecting the flowers starting to bloom across the UK, these floral patterns are bright, bold and beautiful. Exactly what you need for the perfect spring wardrobe. This year especially, embroidered floral patterns can be found on everything from denim skirts to t-shirts. It is also the perfect pattern for festival wear which needs to be light, bright and ready to party in. Try these floral patterns embroidered onto denim shirts, jeans, skirts and everything else so every inch of your wardrobe is spring ready. You can wear them as the centre piece/statement piece or mix and match with other patterns. Just make sure not to go too far with mixing your patterns or the look might be a little over powering. One pattern that is taking the fashion world by storm is check. Evoking everything from cowgirl to country, the check is making a comeback. Many of us may remember it as the pattern on the summer dresses at school or that fancy dress cowgirl outfit but check is a pattern that every spring wardrobe needs. Covering miniskirts, trousers and even the classic boyfriend shirt, check is fun, colourful and great as part of a range of spring outfits. Couple a checked skirt with a plain white shirt or black t-shirt and some statement jewellery to make the perfect party look this season. 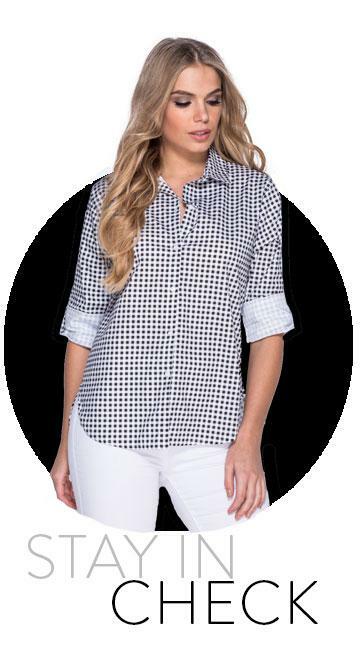 Or you could dress down a check patterned boyfriend shirt with distressed look jeans for any daytime event. Something every spring wardrobe needs is a simple striped look that is statement, stylish and yet extremely simple. This means you can pair your striped piece with white jeans, skirts or even denim shorts and rock up to any event looking amazing. With the off the shoulder look being such a huge part of this year’s wardrobes you can even get yourself a striped shirt that sits off the shoulder. This means you get the chance to show off a little skin no matter what the British weather throws our way. Try styling stripes with plain trousers and skirts so that the striped pattern takes centre stage. Accessorise with a great pair of sunglasses and you have yourself a look that will work all the way through to the heat of summer. It’s time to pack away those winter clothes and embrace all the amazing clothes and patterns that Spring 2017 is throwing our way.